The vast majority of online ads — 82 percent of them — are ignored, according to a February 2014 study by Goo Technologies, a Swedish graphics development firm. 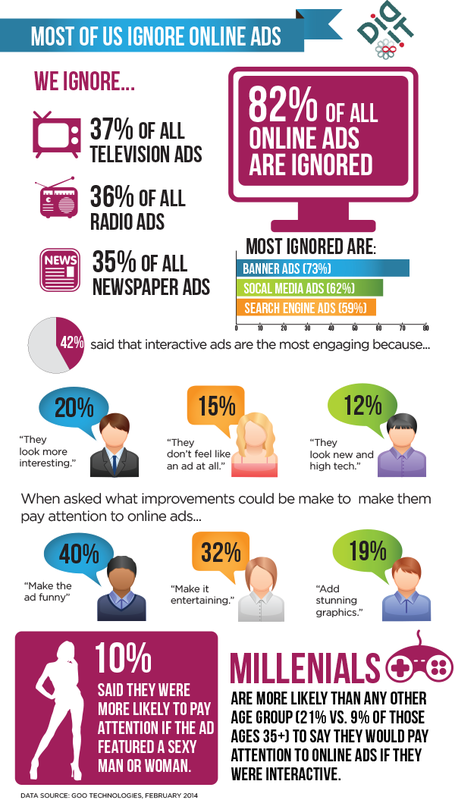 Unsurprisingly, banner ads were found to be the worst online performers (73 percent ignored), followed by social ads (62 percent ignored), and search ads (59 percent ignored). In contrast, less than 37 percent of traditional media (TV, radio, and newspaper) ads are ignored, but that’s no surprise either (it’s much harder to ignore ads that interruptively pre-empt your viewing/listening experience than all but the most aggressive online ad formats (such as pop-ups and homepage takeovers). Goo’s study contains a few rays of hope for online advertisers whose ads are interactive, funny, or visually stunning. Making ads interactive and more game-like is especially important when attempting to reach Millienials, who prize interactivity.